Gluten & Dairy Free Pie Crust – Sweet or Savory This recipe makes 2 Bottom Pie Crusts or 1 Set (top & bottom) Pie Crusts. Mix together the Gluten Free Flour along with optional Salt & Sugar. Blend in Shortening (or butter) with Pastry Tool or Fork, and mix until crumbly. Add in Egg and mix until well incorporated – mixture will still be crumbly. Add Water by stirring in 1 Tablespoon at a time until dough holds together for rolling – better a little moist, then too dry. Shape dough balls into disc with floured hands and place onto a sheet of floured parchment or wax paper. Cover with an additional sheet of parchment or wax paper. Roll crust out to slightly larger than your pie tin. Remove top parchment/wax paper and Slip hand gently under the bottom paper to flip into pie tin… carefully peeling back the paper as you press it into the pan. Don’t worry if it breaks apart a little, you can always press it together and it will look great! Crimp edges of crust to make a decorative edge… or top with an additional crust layer after adding your pie filling. Pierce bottom slightly with fork (and slit top layer with knife to vent). Fill with My Chicken Pot Pie Mixture or Dairy Free Pumpkin Pie Filling Recipe or your favorite recipe and bake. 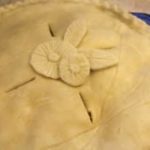 Follow the pie recipe you are using for bake time and temperature. This crust can be prepared in advance & stored in the fridge or freezer (empty or filled) until you are ready to bake. Pre-Bake for approx. 15 minutes at 425 degrees if you need a pre-baked pie crust for your recipe. To prevent the crust from shrinking, add dry beans or pie weights during baking time.